Enjoy cosy camping comfort at Manor Farm Glamping which has a variety of glamping options to suit a range of budgets. Rural location with lovely views. 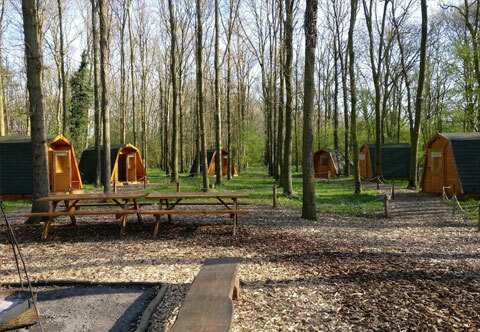 Our flagship site is the Woodland – which is for large group exclusive hire and comprises 8 camping pods, a large central indoor BBQ house with sound system, an outdoor entertainment area, a fully equipped kitchen, and ablutions. This all leads out onto a very large grassy field - Ideal for group celebrations of all kinds! The Paddock has 2, 4 sleeper pods, 2, 5 sleeper pods and a 7 sleeper Safari tent. An ideal site for couples or families with spectacular views over the countryside and beautiful walks along the River Isbourne. There is a communal utility barn and shower block adjacent to the Paddock. If couples are looking for something special, tucked away amongst the farm buildings, we have Red Sky Shepherd’s Hut which has a completely private, pretty enclosed garden and hot tub. In addition, we have our Wild Camping site alongside the river for those who wish to pitch their own tents in a more rustic setting. Basic facilities are supplied. All in all, a superb location for those who love the great outdoors, with accommodation to suit all needs and preferences!